Shrinivas Sugandhalaya: makers of the world famous Sai Baba Nag Champa. We offer one of largest selections anywhere in the US! All of these are slow burning, very fragrance and long lasting. Our 9 pack sampler is one of our best sellers and a great way to discover these great scents. 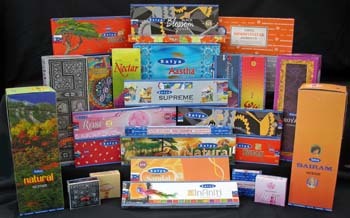 If you like Sai Baba Nag Champa incense, all of these will sure to please you. All of these are Masala based just like Nag Champa (soft and moist). Other products you may enjoy. The Original Nag Champa Incense.